Aichmetai Leukanoi are javelin-equipped skirmishers. They run forward to pepper an enemy with javelins, and then withdraw before a counter-attack can be organised. Aichmetai Leukanoi are deployed and used as most javelin-equipped skirmishers. They run forward to pepper an enemy with javelins, and then withdraw before a counter-attack can be organised. Their job is to screen the main force of the army, and harass the enemy with a shower of javelins to disrupt their formation, so the more heavier infantry can engage with better odds. The Aichmetai Leukanoi are equipped with javelins, a knife and nothing more. Their speed is their best and only armour. Any wise general should thus try to keep them unexposed to enemy cavalry, as in melee the light infantry will quickly rout. Historically, the Leukanoi occupied the province of Calabria in the 4th century B.C, except for the Greek coastal colonies. They were either at war or allied with their neighbours throughout their history. 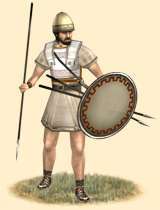 They allied themselves with Pyrrhos of Epeiros when he invaded, and although defeated and subjugated by Romans after the Pyrrhic War, they joined Hannibal during the Second Punic War and raised an army of 20.000 men to fight for him. After the war ended, the Leukanoi were defeated again, and their homeland and population was devastated. The Social War in 91-88 B.C saw the end of them as a people.